GOI announced withdrawn / ban on Rs.500 and Rs.1000 currency notes - Why ? RBI explains it well enough. As the Government of India announced the withdrawn ban of Rs.500 and Rs.1000 currency notes in fight against the fake and black currency along with corruption. Reserve Bank of India (RBI) came up details to support the governments move. Here are few points which help you understand the process and how it helps fight against fake and black currency. Also these points will help a common man to exchange currency at banks. 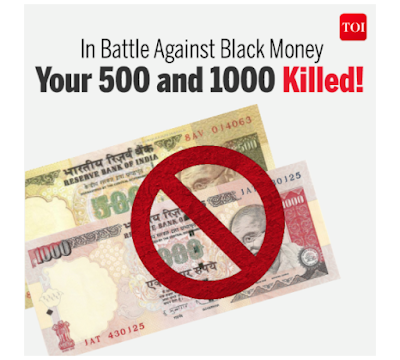 The currency notes in denominations of ₹ 500 and ₹ 1000 stands withdrawn. In consequence thereof withdrawn old high denomination (OHD) notes cannot be used for transacting business and/or store of value for future usage. The OHD notes can be exchanged for value at any of the 19 offices of the Reserve Bank of India or at any of the bank branches or at any Head Post Office or Sub-Post Office. The fake Indian currency notes are circulating in higher denominations and it has increased. For ordinary persons, the fake notes look similar to genuine notes, even though no security feature has been copied. The fake notes are used for antinational and illegal activities. High denomination notes have been misused by terrorists and for hoarding black money. India remains a cash based economy hence the circulation of Fake Indian Currency Notes continues to be a menace. In order to put an end to the rising incidence of fake notes and black money, the scheme to withdraw / ban of Rs.500 and Rs.1000 currency notes has been introduced.